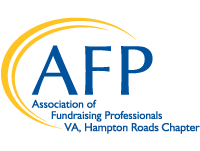 AFP-Hampton Roads is seeking strong candidates to join our board. If you have enjoyed serving on a committee and attending luncheons, we encourage you to take the next step and join the board. The time is here – it’s board nomination season. You are willing to help make our chapter even better. As with any volunteer opportunity, you'll need to dedicate time and effort. Board service at AFP Hampton Roads offers many leadership opportunities that will help you grow professionally and personally. Download the 2019 Board Nomination Form here and submit to Laurie Harrison by September 4, 2018. The slate of directors and officers will be presented at our October Annual Meeting.